I rolled out of bed, refilled the food dishes and took stock of the kitchen. I desperately need to wash dishes. I've got them stacked here and there. But, I really don't want to do that now. I am close to finishing this book. I poured myself a bowl of strawberry Frosted Mini-Wheats, took that to my new recliner, reclined and started reading. An hour and a half later, I was done. Now it's time for a review. Simon Winchester wrote a well-received book called "The Professor and the Madman" about the making of the Oxford English Dictionary. It's been on my TBR (To Be Read) list since coming out. When I bought this book, many years ago, I didn't buy it because of the author's reputation. I bought it because of the subject matter. 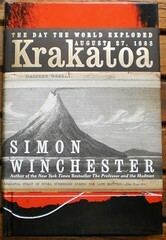 "Krakatoa" has come to be synonymous with "major catastrophe". If you are a student or even have a passing interest in world history, the story of this volcano blowing itself apart is compelling. I don't know that I had an expectations for the book other than to learn about the volcano and how its eruption affected the people in Java and Sumatra. It met those expectations. The criticism I have is that there is a lot of "stuff" in this book, stuff that I don't feel helped tell the story. It's 335 pages, of which, as far as I'm concerned, a good 150 could have been excised and the story not diminished. Politics of the region were not changed by the volcano's eruption, as a for instance. There's 8 pages I didn't need to slog through. In trying to paint a complete picture of the volcano and the area of the world it inhabits, the author's attempt at thoroughness overshot the need to just tell what happened and its repercussions. Not enough was given over to what the area is like now and too much was told about ancient human history. The volcano doesn't erupt until page 232. I have to say that from roughly page 185 onward, the narrative is compelling. You know he's leading up to the eruption. Once it does explode, the next 50 pages which tell what happened and how the eruption was felt all around the world, are intense reading. Krakatoa had the distinction of being the first natural disaster transmitted with almost immediacy thanks to transoceanic cables. People in London knew it was happening as close to it happening as possible. This would be the 19th century equivalent of the Japanese tsunami. I picked up the magazines off the floor and organized them into piles. Scottish magazines and half-size magazines are at the back right. Left are old Discovery and Cooking Light magazines as well as the newsletters from The Society for the Preservation of English Language and Literature. In the front right are nature and pet magazines. I moved the 4 books that were here to the bedroom. This is only going to be magazines until I get all of these read. I know, why save something that's a few years old? I always learn something. It's important to me to read through them even if what that will amount to is a cursory glance. I also made a stack of Mac/Life magazines. The shelf life on computer magazines is less than the computer they cover, plus they are much faster to "read" since I don't own an iPhone or an iPad. I feel those of us using desktop or laptop computers are being left behind in the race for portability. I can easily page through these magazines and toss them because there aren't articles about utilizing your desktop machine to its fullest. I thought I had been on top of this subscription but, you can see, the top magazine touts the benefits of the iPhone G3, long since eclipsed by the G4. 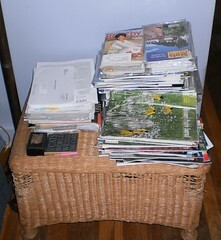 I did find current issues in this pile and there was an article comparing programs for writing books. That was interesting. But, for the most part, I could be done with one of these in 10 minutes. I won't miss this when it ceases to come to the door. I'm not sure what I will be reading next. I like to put my next book on the dresser by the bed, but nothing leaped out at me from the stack and said, "Read me next!" I think I shall work on the newsletter, cooking, Discover pile. That's not very big and it will be a keen sense of accomplishment when that stack is gone.